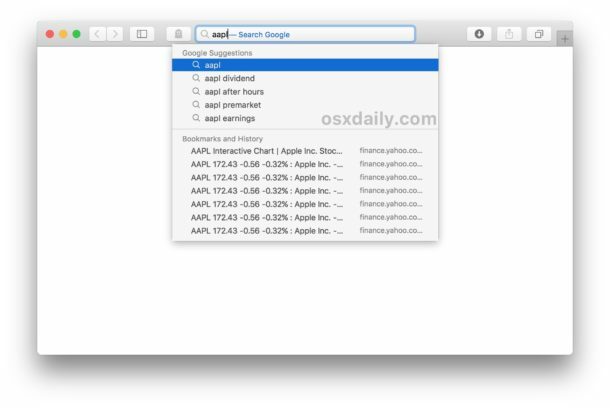 The Safari browser for Mac offers a feature called “Safari Suggestions” which detects what you’re typing into the URL bar / search box and, much like the name implies, offers suggestions based on what you typed. For example, if you type “AAPL” into the Safari Search box, you’ll see the stock price for that ticker symbol as it appears directly under the Safari address bar, or if you type “Carl Sagan” you’ll see a short blurb and a link to Wikipedia appear under the Safari URL bar. Many Mac users undoubtedly like Safari Suggestions since it can offer a shortcut for searching and finding specific information, but some users may not appreciate the feature and would rather disable it. This works for both Safari and Safari Technology Preview, obviously you’ll need a modern version of the application which supports the feature in the first place to be able to disable it. If you do not see the option available, the Safari version in use is not new enough to have the feature anyway. You can immediately confirm that Safari Suggestions have been disabled by clicking into the address bar and typing something that would typically result in a suggestion, for example a ticker symbol, or a famous persons name, or a popular movie. With Safari Suggestions disabled, those little recommendations won’t show up anymore. * Note that Safari Suggestions are different from search engine suggestions, which come from the default search engine in Safari. If you want to not see those any longer, you can disable search engine suggestions on Safari for Mac too. Yes the names are similar, but the functionality is different. If you’re an iPhone and iPad user as well, you might also appreciate knowing that you can also disable Safari Suggestions in iOS too if desired. 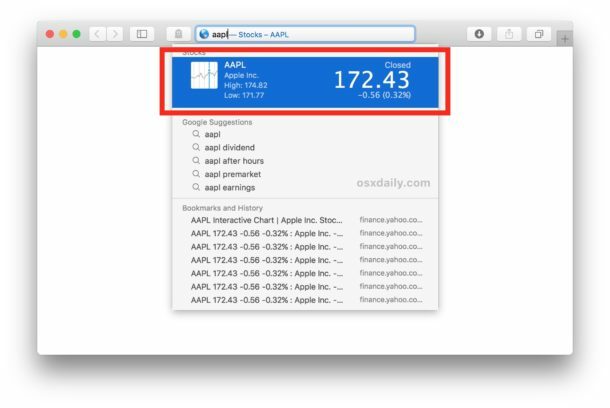 Aside from personal preferences, some older Macs may notice a slight performance boost to Safari by turning this feature off, and disabling the Suggestions options have been a a resolution to stop Safari freezing with address bar usage in the past too. Oh and while you’re tinkering with Safari settings, you might want to enable the setting to show a full website URL in the Safari address bar too, something that is curiously disabled by default in modern Mac OS releases. Thanks for this tip. Very, very helpful.